Since 2001, Mr. Axelrod has conducted over 160 orchestras around the world, 30 operas and 50 world premieres. Among his long-term relationships with European orchestras are Berlin's RSB, NDR Symphony Hamburg, hr-Sinfonieorchester Frankfurt, Orchestra Sinfonica della RAI Torino, Teatro La Fenice Orchestra in Venice, Orchestra del Maggio Musicale Fiorentino, Orchestre de Paris, Orchestra Svizzera Italiana in Lugano and the Mariinsky Orchestra. In Japan, Mr. Axelrod regularly conducts the NHK and Kyoto Symphony Orchestras. In the USA, Mr. Axelrod has performed with the Chicago Symphony, Los Angeles Philharmonic, and the Philadelphia Orchestra among others. Highlights of Maestro Axelrod’s upcoming engagements include debuts with the Symphonieorchester des Bayerischen Rundfunks, the Filarmonica della Scala, the Prague Radio Symphony, the Netherlands Philharmonic, the Antwerp Symphony Orchestra, and returns to the RAI Symphony Orchestra, the OSI in Lugano, the Maggio Musicale Fiorentino Orchestra, at the Enescu Festival, the Beethoven Festival in Warsaw, and the Pacific Music Festival in Sapporo, Japan. John Axelrod’s recent opera activity includes Bernstein's Candide at Théâtre du Châtelet, Teatro alla Scala and Maggio Musicale Fiorentino, Eugene Onegin at Teatro San Carlo in Naples, Kurt Weill’s Aufstieg und Fall der Stadt Mahagonny at the Rome Opera, Martinu’s Mirandolina at Teatro la Fenice in Venice, the premiere of Fabio Vacchi’s Lo Specchio Magico at the Maggio Musicale Fiorentino Festival, La Traviata at the Opera di Firenze. 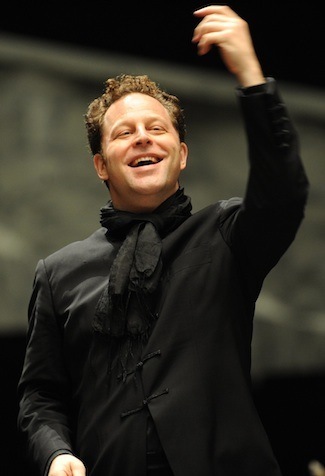 For the Lucerne Festival from 2004-2009, he conducted: Rigoletto, The Rake's Progress, Don Giovanni, the Three Penny Opera, Falstaff and Idomeneo. Upcoming opera engagements include Montalti’s Un marziano a Roma for the Teatro dell’Opera in Roma. Mr. Axelrod has recorded core and contemporary repertoire for Sony Classical, Warner Classics, Ondine, Universal, Naïve and Nimbus. Mr. Axelrod's most recent release is a cycle of Brahms Symphonies combined with Clara Schumann lieder entitled Brahms Beloved on Telarc, with Orchestra Sinfonica di Milano Giuseppe Verdi and accompanying Dame Felicity Lott, Wolfgang Holzmair, Indra Thomas and Nicole Cabell. 2018-19 short version for program booklet (June 2018) - Not to be altered without permission.